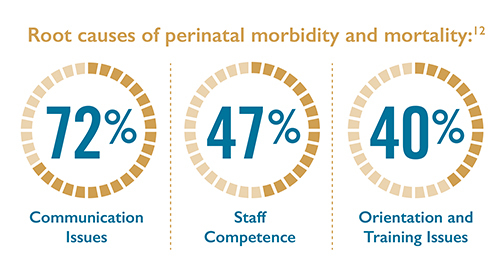 In the first story, the attending staff had trained aggressively to identify and manage labor and delivery emergencies. Upon diagnosing the immediacy of the risk factors present, the staff carried out a well-planned and rehearsed effort that avoided harm to the child. To the joy of the family, the birth was a resounding success. At a nearby facility a similar emergency occurred, but a different story was playing out. How the circumstances were diagnosed and addressed led to emergency interventions that proved fatal to the child and resulted in a $10.2 million award to the mother. To the family, 1% means everything. That 1% stands in the way of the child’s survival, and increases the chance of brain damage even if he or she does survive. The mother who trusts that she will receive the best possible care expects that her providers have been fully prepared for the 1% risk. One Minute: Too Short to Do Anything? The “Golden Minute” refers to the first 60 seconds of an infant’s life. Within these limited seconds, the infant should begin breathing on his or her own, or interventions must be started. In each case, steps taken to treat an infant must be precise and timely. Perinatal asphyxia and extreme prematurity are two pregnancy complications that can necessitate complex resuscitation; however, only 60% of asphyxiated newborns can be predicted antepartum.9 The remaining newborns are not identified until the “Golden Minute,” which is why it is critical to prepare. Following delivery and cutting of the umbilical cord, initial assessment of the newborn should be viewed as a continuum that begins with routine care and may or may not progress to further resuscitation. Due to the frequent need for resuscitation at birth, it is critical to have evidence-based care guidelines and to train for effective neonatal resuscitation. To ensure that healthcare providers remain up-to-date on advances in neonatal resuscitation, the American Heart Association (AHA) and American Academy of Pediatrics (AAP) jointly develop neonatal treatment guidelines for the United States. The Neonatal Resuscitation Program® (NRP®), which is developed by the American Academy of Pediatrics, translates the AAP/AHA Guidelines for Emergency Cardiovascular Care and Resuscitation of the Neonate into an educational curriculum. The curriculum developed by the AAP includes: eSim, skills practice, online exam, and simulation/debriefing. The blended learning approach helps to prepare healthcare professionals to facilitate effective team-based care. The NRP curriculum helps to increase a care team’s confidence and improve each member’s resuscitation and stabilization skills. Moreover, the curriculum specifically addresses communication and the decision-making processes that are essential in the first—and most important—60 seconds of a newborn’s life. Simulation plays a vital role in learning NRP. Simulation reinforces skills and knowledge integration; but, more importantly, it introduces human factors and a focus on patient safety into the scenario. Team communications, interactions with the parents, and the inevitable feeling of uneasiness when a newborn is in distress can all be recreated during a simulation, lessening the stress level when faced with a critically ill newborn. Following simulation training, care providers are likely to see an improvement in clinical decision-making, sharpened skills, and increased self-confidence all of which are critical during neonatal resuscitation. What have learners said about simulation? A skilled, confident, and cohesive care team can make all the difference in the first minute of a baby’s life. 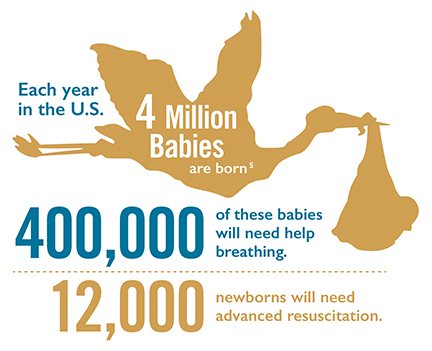 With neonatal resuscitation training, healthcare professionals are better equipped to recognize a newborn in distress and begin treatment within 60 seconds. One minute can determine a life and a lifetime. In keeping with our mission of helping save lives, Laerdal is committed to helping you provide the training that can prepare practitioners to manage every second of that minute. We want to help you ensure that every birth you touch, directly or indirectly, is a happy beginning. Heerden, V. (2012). An introduction to helping babies breathe: The golden minute is here for south African newborn babies. Professional Nursing Today, 16(3). American Heart Association. (2005). See reference #4. Halamek, L.P., Kaeji, D.M., Gaba, D.M., Sowb, Y.A., Smith, B.C., Smith, B.E., et al. (2000). Time for a new paradigm in pediatric medical education: Teaching neonatal resuscitation in a simulated delivery room environment. Pediatrics, 106(45).